Getting the right home theater can be tough. Avoid these big mistakes when planning your theater room. Many homeowners are focusing on their home theater systems these days, as it can be the primary location for their family members to spend time together. You can gather together and enjoy a television show, movie, or video game. It’s great to start thinking about your home theater dreams, but there are a few mistakes you want to steer clear of. 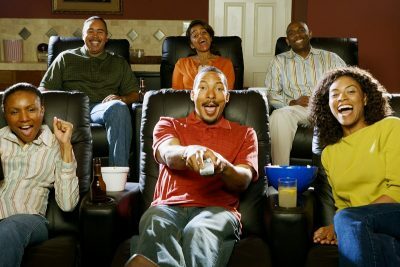 We’ve compiled a list of the biggest home theater mistakes we think everyone should avoid. A huge mistake many people make is installing their home theater in a room that has several large windows. Natural light may seem like a good thing, but it can actually cause awful glare during daytime viewing. Plus, if your windows face across a street, headlights from cars could cause even more glare during the night. Make sure you invest in blinds or shades if you’re going to have your home theater somewhere with windows. Investing in the right speakers can be a huge deal. Some people cut corners with audio and focus their money on getting the best screen possible, but you don’t want to miss out on the best audio experience. Be sure to get the right sound system for your needs, such as a compact soundbar or an audio system fit for your whole home. Sound is about as equally important as video, so don’t miss out on the full experience. The worst thing you can do is install your home theater setup improperly. This could potentially cause damage to your expensive new tech and waste you a lot of time and money. The best thing to do is hire a smart home installer, like our experts at ITG Smart, to do all the heavy lifting for you. You can rest assured knowing that your home theater setup will be installed by the pros. Ready to have a home as smart as you are? Integrated Technologies Group has the expertise and great prices to make it happen. We have been providing Maryland residents with top-notch home theater services, home security services, and home automation services for over a decade. We work throughout Maryland, Pennsylvania, Virginia, Delaware, and West Virginia. Ready to get a quote to make your smart home dreams a reality? Give us a call at 1-800-560-3280 or visit us online. For more informative articles, follow us on Facebook, Twitter, Pinterest, and Google+. This entry was posted on Friday, June 9th, 2017	at 5:30 pm	and is filed under Blog, Home Theater System	. You can follow any responses to this entry through the RSS 2.0	feed. Both comments and pings are currently closed.